Calendula is a botanical that is commonly added to skin care products because of its incredible ability to repair and rejuvenate the skin. 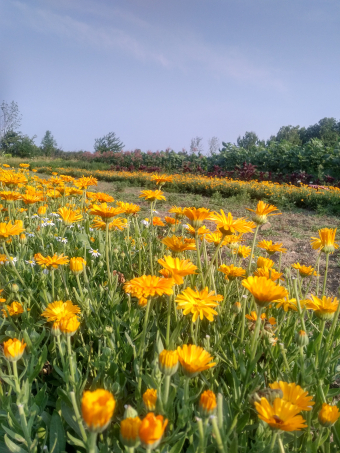 We would like to be able to declare that Calendula is a rare and exotic botanical but the reality is, this is a common garden flower that is both easy to grow and thrives under the most hostile conditions. Take this summer, for example. Our little area of the world experienced severe drought conditions and yet our Calendula crop rewarded us with bumper yields of perfect blooms and, at time of writing, is still going strong. Used since Roman times for healing, internal complaints and cooking, Calendula really began its widespread recognition when doctors on the American Civil War battlefields used it as an antiseptic, to prevent infection and to speed the healing of wounds. Its success as an antiseptic, astringent and antimicrobial remedy in such dire conditions has made its continued use guaranteed. There are many cultivars of Calendula available but we are dedicated to growing Calendula officinalis c.v. Calypso Orange exclusively because it has the highest active medicinal content. Bright, bright orange flowers with lots and lots of resin on them, these are the not only the best flowers for your skin but having trialed many different varieties of Calendula over the years, this one is definitely the most intensely gifted with numerous attributes. We regret how we balked at paying 2000% more for the seed now that we know how much more superior this cultivar is. For centuries herbalists have trusted Calendula to soothe dry and inflamed skin conditions making it an excellent addition to skin and lip formulations. With the increased restorative properties of our Calendula it is perfect for dry or damaged skin and offers excellent healing qualities with ongoing protection from premature aging. We harvest Calendula at the peak of its bloom cycle and preserve its signature in a number of different ways. Thousands of fresh blooms are copper distilled to produce extremely high quality hydrosol. Other fresh blooms are used in the production of glycerites using vegetable glycerine. Finally, we dry bushel loads of the Calendula blooms for the production of infused oils or for use in soaps and facial steams. With everything riding on the quality of our Calendula you can rest assured that no chemicals or synthetics are used in their production. This lavish care and attention on producing the flowers results, ultimately, in superior skin care. 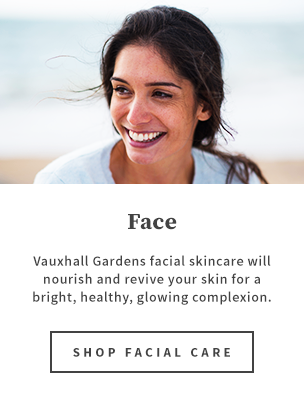 When research shows that Calendula stimulates cell regeneration for younger looking skin you can rest assured that the Calendula grown by Vauxhall is going to be working harder at doing this for you than any other product that is claiming to use Calendula in their formulations.